In conjunction with UW-Madison’s Homecoming, the Department of Dairy Science is launching a social media effort to promote and share the pride that current students, alumni, and stakeholders have in their connection to the department. UW’s Homecoming week is November 5-12, 2016 and reconnects Badgers with the spirit and tradition they love about campus. Just as the University encourages people to come back together to celebrate their alma mater, so does Dairy Science. Did you know the department has over 1,400 living alumni, a majority of them working in some facet of the dairy industry? 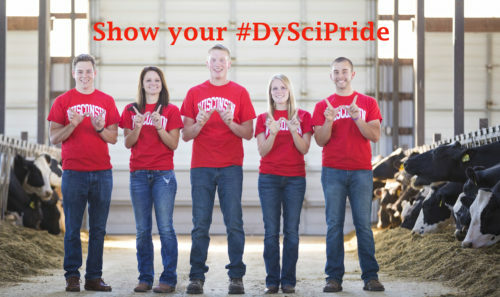 UW-Madison Dairy Science values the relationships and attachments that our current students and alumni share, and therefore, encourage everyone to participate in an effort to showcase this pride by using the hashtag #DySciPride.